Anne Hathaway is all fired up! The actress debuted shocking red hair while out and about in New York City on Wednesday. Anne paired her new ‘do with an equally bold ensemble, donning pleated yellow culottes with a sequined top and fur-collared jacket as she strolled the streets of Manhattan. Photos captured Anne’s tresses in a perfectly tousled, camera-ready style, which is apparently right on point. 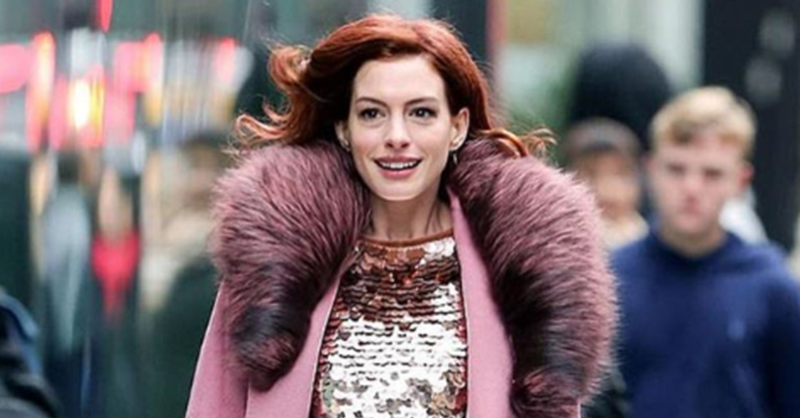 While some have speculated that the redheaded experiment could be a wig, it’s far from the first time Anne has made a major hair change for a role. She famously shaved off her brunette mane to play the doomed Fantine in 2012’s “Les Miserables,” and it paid off – she took home the Best Supporting Actress Oscar for her work. Red hair, no hair, don’t care! Anne isn’t afraid to take risks at the salon for the sake of her craft.